Fundraiser by Sabrina Bodden : Mobilize Me! Hello! Thank you for taking time to check out my campaign! I'm offering rewards to donors who contribute $50 or more! Info at bottom of page. For people or businesses willing to contribute $500 or more, I'll be adding their name or logo as sponsors to the exterior of my truck, equalling some pretty sweet advertising if you ask me! In 2005, I was injured working in a factory. While I had long-term disability insurance coverage in case that happened, but rather than having my income and health insurance protected as the insurance guaranteed, I was illegally laid off and didn't have the knowledge or ability to fight it at the time. I lost my income, health care, and ability to work all at once. It took me four years to get my body well enough to work after my body crippled in 2005. I took out student loans and credit cards to survive. In school, I studied anatomy and physiology, and therapeutic massage, and empowered myself to get functional again. After years of physical therapy, chiropractic care, acupuncture, yoga, and massage, I no longer need to use a walker, and my right arm is no longer folded up into my chest. I can use both arms most days! I even went from school into a career as a very-part-time massage therapist after getting certified and licensed in 2010. Since the average careers span for a massage therapist is 5 years, I'm proud that I've toughed it out and continued to serve my customers this long, but for the past few of years I've only been able to give one or two massages per week, and those couple hours have required hours days of rehabilitation. Most recently I've been dealing with a chronically dislocated/swollen elbow causing shooting pain and weakness along my right fingers into my shoulder, and haven't been able to work in over a month (as of Feb 28). It's time I accept that I cannot give massage anymore and make my craft business my full time focus. Unfortunately, while my condition has improved, I've continued to struggle to work in traditional job settings. While I'm a very capable person, my spinal disorders and nerve damage make it difficult to sustain gainful, competitive employment. I'm also on the autistic spectrum, which adds to the struggle of maintaining an accessible workplace environment. In late 2015, facing a lot of fear and feeling my spinal condition worsening, I started making and selling jewelry online. I've been incredibly fortunate to find a business that has helped me earn some independence and freedom in my life. ~This business allows me the flexibility to stay home and honor the needs of my body if it's not allowing me to function well or get dressed on any day, without hurting myself more. 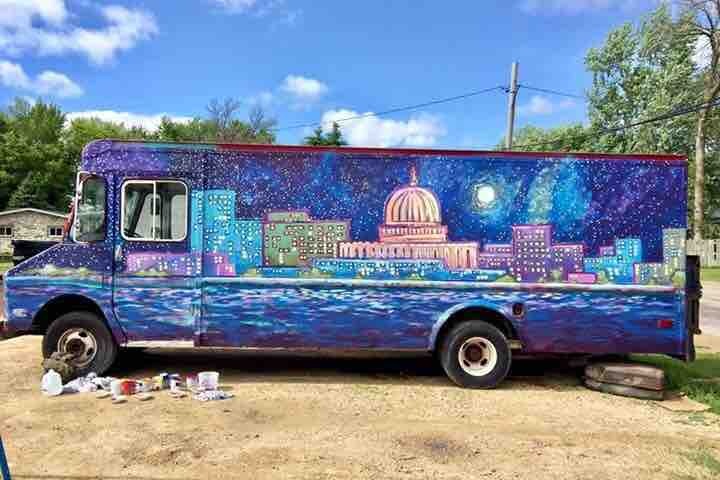 ~This business will create opportunity for other local artists, as I'll have a large retail area inside the truck, and at many events, will be able to retail products made by other artists as well as my own! Unfortunately, the physical demands of hauling and setting up a heavy duty canopy, tables, and all of my heavy stone jewelry in and out of my home, and in and out of my car each day is wearing on me. Many days I cannot work because the setup and tear down process are too much for my body. It has become clear that if I am going to continue working this business, I need to change how I show up at outdoor events. My idea is to build a "mobile boutique" so that I can drive up to events, invite shoppers inside, and save myself two-four hours per day loading and unloading, along with the days of recovery the setup often requires. In 2017, with my partner's help, I purchased an old Grumman P30 (like the UPS & FedEx trucks where the driver never shuts the door). While the truck ran well enough during the test drive, unfortunately, it broke down on the way home from buying it! After towing to multiple mechanics over the past year and a half, I finally found out how much the repairs are going to be, and found a shop that can handle the job. Sadly, the head gaskets are blown and cannot be saved. The truck needs an engine replacement! The quote for the job is $8680.65 (including labor and tax). It's pricier than most engine replacements because of the unique design of the Grumman P30 vehicle - the engine needs to be pulled out and installed from the inside of the truck, rather than through the hood, and special equipment is needed for this to happen. To put a deposit down and get started on this project, I need to raise $4340. I'll need to raise another $4340 as soon as possible after that first to pay the shop when they've completed the job. This all totals up to the $11,630 in anticipated costs to get my mobile boutique built and running reliably. I'm confident I'll sell enough this Summer to get a lot of this process finished myself, but I need help getting the deposit on the engine replacement down so they can begin repairs. This will help ensure that I can use the truck the whole season, and allow me to work/earn a lot more. Since becoming disabled in 2005, I’ve barely been able to earn $10K in annual income, so this goal is BIG to me. Luckily my income has been slowly but steadily increasing over the years since starting to make and sell crafts. Getting my mobile boutique running would make a huge difference for me in terms of my ability to earn income, and my quality of life. 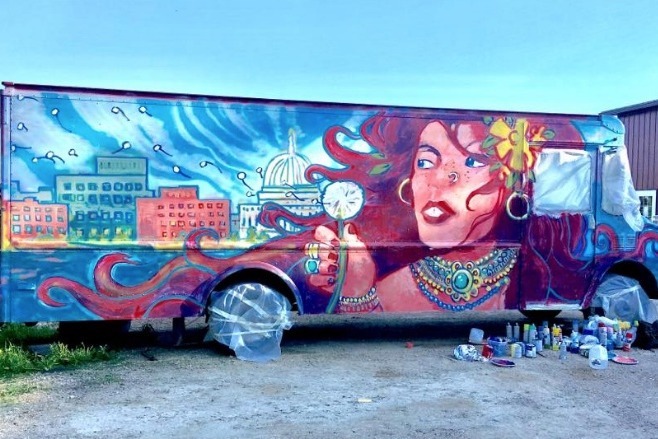 ***If my fundraiser raises more than what I need to get this project going, the extra money will go toward solar panel installation so that I can make the truck more eco friendly. If you're interested in specifically contributing to this idea, please reach out! I'd prefer not having a gas generator if I can avoid it, but it seems to be the most economical option to get started. I realize there are people with emergency needs, and I hope you are giving there, too. I've been encouraged to ask my fans for help. I'm not sure how else I'm going to make this happen. If you're inspired and want to contribute to this project, that would make a meaningful difference in my life. In addition to seeking donations toward this project (which will be rewarded - see bottom of gofundme page for more info! ), I'm encouraging fans to host DIY Make & Take Parties for their friends. This is an uncomfortable and shame-filled process for me (darn ego!). I'm hoping that by sharing my story, and by asking for help, that I encourage and give permission to not only to ask for help, but to pursue creative endeavors and solutions to challenges they're facing. While I'm not asking for money for health bills or an emergency, my struggle is a direct result of a sudden loss of health, and over a decade of debt and struggle that has come of it. 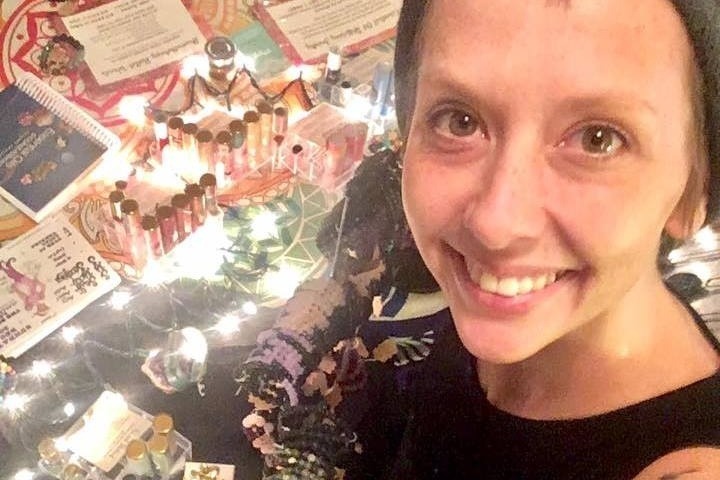 Rather than asking for help paying my medical expenses, I'm trying to be creative in making a path to sustainable income so I can pay them myself. Any support given is extremely appreciated. Any contribution helps. $10 or $100 or $1000! Sharing helps, too! If you'd like some fliers to hand out, I'll get you some. If you know of any good vendor opportunities, my Spring calendar could use more bookings! Anything you can do to contribute / share / boost / encourage is SO APPRECIATED! ***If you know of any business that would like to invest in a great advertising opportunity, please share this directly with them and tell them why you believe in this project or want to support me. $500 donors and above will have their names printed on the exterior of the truck / listed as sponsors! What a great way to get the word out about your business! I love the concept of offering rewards / incentives for contributions, so here you go! Thanks to another offline donation this week, we've raised a total of $2321 toward the goal of $4340 to get the deposit down for the engine replacement!!! Just $2019 to go! I'm feeling so incredibly loved and supported today as I turn 35, and celebrate the 28 donation I've gotten over the past month working on this campaign! THANKS to everyone who has contributed and/or shared! Thanks to another $100 offline donation, and the three birthday gifts today, we've raised a total of $1371 so far! That means only $2969 to go before we can start repairs on the truck! I've updated the goal to reflect the offline donations, and to focus on the current goal of getting the 50% deposit down on the engine replacement. Got another $35 offline donation today! Thank you Judy Ettinger! !